Marie of Celebration Generation Cakes spotted the Super Mario Bros cake I posted last month and was all, “Yeah, I guess that’s pretty good. If you’re into cakes that are LAME with a side of WEAK!” (or something thereabouts) and promptly sent me details on this epic, multi-tiered Super Mario Bros cake she made for a wedding back in December. We do a lot of nerdy/geeky cakes. Nerds and Geeks are our favorite clients, being a nerd (me) and geek (hubby) ourselves! 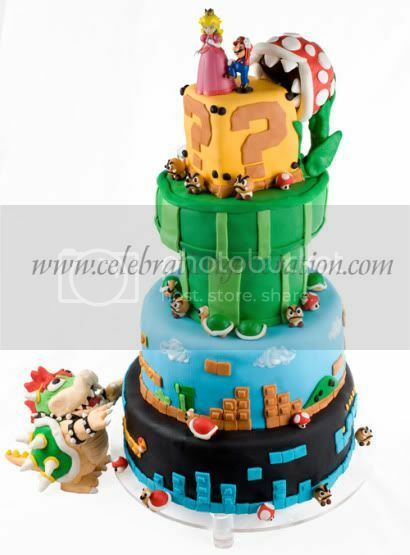 The couple was awesome to work with – *needed* a Super Mario wedding cake. All of the goombas and troopas are all hand made out of fondant. Everything (Aside from the Mario and Princess toppers) is completely edible. 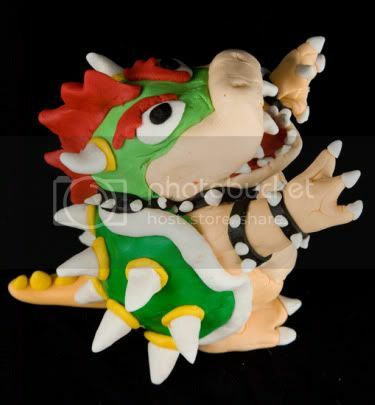 Bowser and the Pirahna Flower are made from Rice Krispie Treat, covered and detailed with fondant. Yes, super-accurate and true to the source material. Both prerequisites in a caketastic game of in your face! And I don’t suppose this entry in a competition of confectionery one-upmanship would feature a mundane flavor like “chocolate” or “vanilla,” now would it? The main cake was our “Tirimisu” – Amaretto white cake layers, each brushed with Kahlua.. then spread with a lightly Kahlua flavored chocolate ganache, then filled with a Mascarpone Swiss Meringue Buttercream. Right, my third guess. Also? I haven’t eaten in a few hours and now I want to bludgeon this cake with my agape-mouthed face. I’m salivating like Pavlov’s dog after someone’s spilled a crateful of bells at lunchtime. Thanks to Marie for sharing and for keeping a healthy spirit of competition alive. Even if it wasn’t as bitter and vitriolic as I would have enjoyed. Check out the “Geeking Out!” section of her gallery on the Celebration Generation Cakes Web site. I don’t want to eat it… I just want to make sweet love to it! Love the attention to detail. It would almost be a shame to eat such a beautiful cake, but it does look really yummy.